Canadian Home Love: Hooray Duvet! Finally! I've finished the duvet for our master bedroom! I bought the fabric sometime in November and didn't start it until yesterday. It took two nights, two spools of thread and 2 1/2 romantic comedies to complete! I'm quite pleased with the results. I went out and bought a king duvet for our queen bed as our queen duvet still showed the sheets on the sides and simply didn't look clean. Luckily the fabric I had bought worked out perfectly for the larger size (woot woot!). It took a lot of precise measuring and lining up the pattern, not to mention getting the zipper lined up and sewn in properly. All in all it was worth the effort I think. 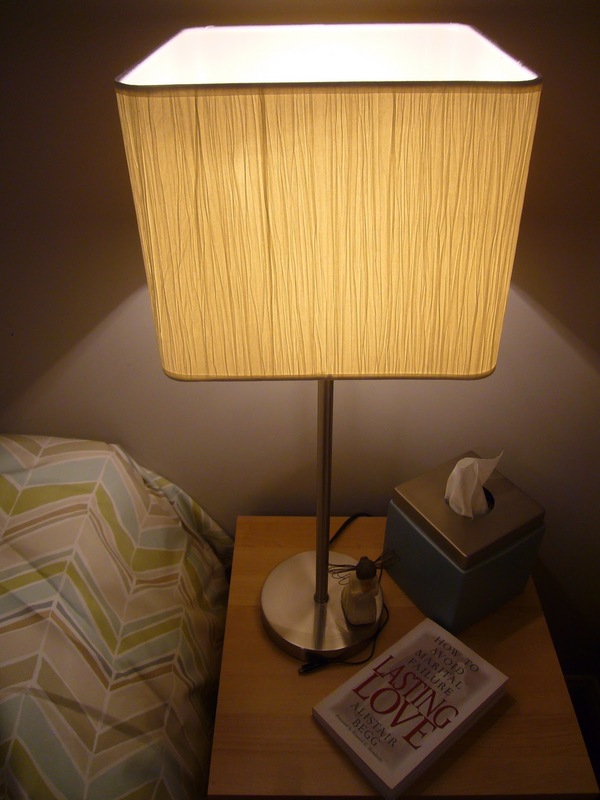 Oh, and I got shades for our lamps, finally! Unfortunately the stands we got from Bou Clair don't match up with most other shades so I was pretty much forced to go back and get them there. Not that I don't like them, but I usually don't like being tied down to one store. It's a nice basic shade, but I may add a ribbon to the top and bottom rims to help tie them into the room a bit more.